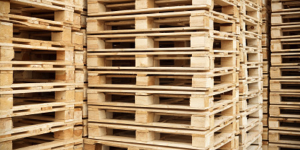 Pallet Manufacturers | Trio Forest Products, Inc. The Challenge : Producing a product (Pallets) made with a material (Wood) that is commodity based and fluctuates in price constantly while holding steady to a fixed contract price with your customer and staying profitable. Welcome to the world of Pallet Manufacturing! The Answer: Trio Forest Products Inc. understands your needs in competitive prices and fast delivery. Low grade lumber can be tough to purchase at times. It takes years to establish relationships with enough lumber mills to enable the purchase of low grade lumber on a regular basis. Longevity in the industry, bulk orders, good credit and reputation earns you buying power with the mills. Trio has established long term relationships with several mills so that we can meet Pallet Manufacturers ongoing needs in delivering low grade lumber at a price that ensures you can continue to produce pallets profitably. Our goal is to provide you with quality lumber at prices that keep you profitable. Money Saving Tip: If you find that you are having too much waste, considering moving up to a higher grade product. In the long run, sometimes this may save frustration and money. Another idea may be to use green mill run rough if you do not need an HT product. We are here to help you figure it out. We have custom Mill Working Services available and can meet most any need that you have in a product or custom cut stock. For more information on Custom Millworking click here. For additional information about our Products click here. For additional information about our Customer Resources click here.